Transport can be a bit of an acronym soup at the best of times but 2018 feels like it’s taken that to a new level. So far already we’ve had the ATAP, the GPS and the RLTP. 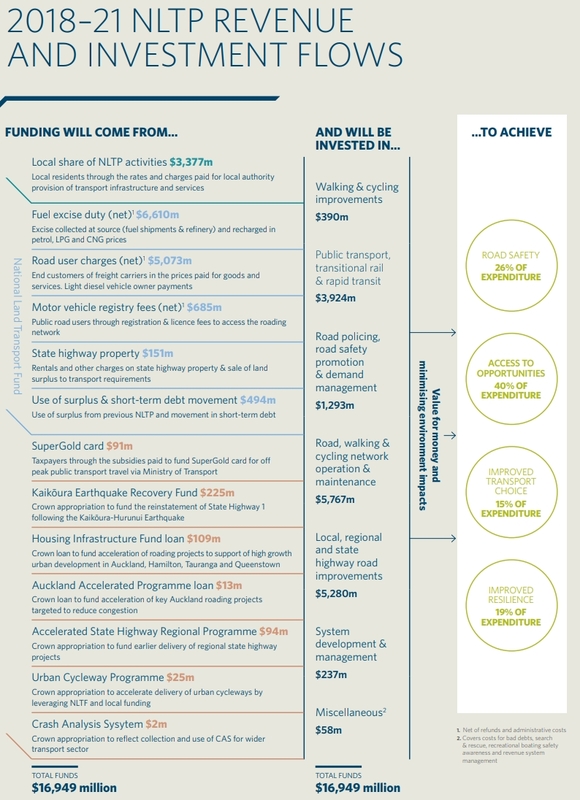 On Friday the government released the 2018-21 National Land Transport Programme (NLTP) – there’s still the new RPTP to come too. 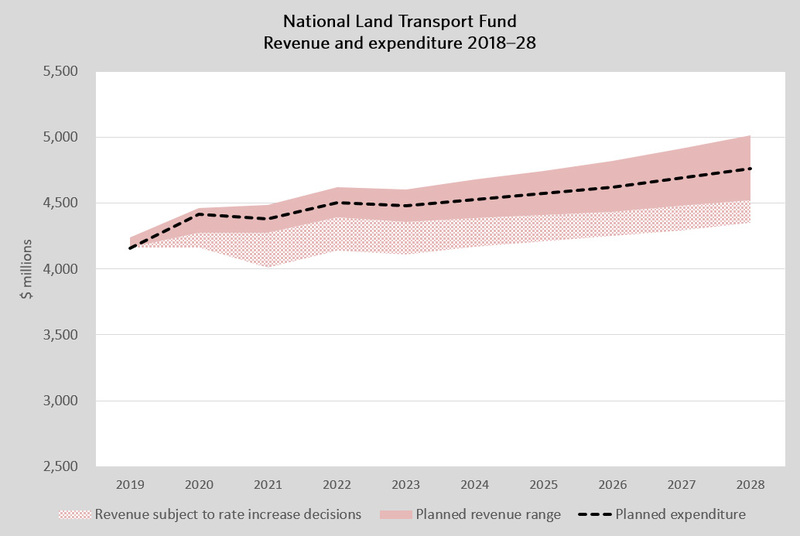 The National Land Transport Programme (NLTP) is a three-year programme of planned activities and a 10-year forecast of revenue and expenditure prepared by the NZ Transport Agency to give effect to the GPS. The NLTP is a partnership between the Transport Agency, which invests NLTF funding on behalf of the Crown, and local government, which invests local funding on behalf of ratepayers. So essentially it shows what is expected to be done in transport over the coming three years and with $16.9 billion expected to be spent over that time, there’s a lot that will be done. The graphic below shows where the money comes from and what it will be used for. The amount being spent on transport through the NLTP has increased with every three-yearly iteration but its notable just how much it has changed over the past decade. The 2009-12 NLTP hailed an investment of $8.7 billion, so transport spending has nearly doubled in a decade. That was followed by $12.3 billion in 2012-15 and $13.9 billion in 2015-18. The largest source of funds for transport comes from fuel and road user charges (NLTF). The graph below shows how that is expected to change over the coming mounts. 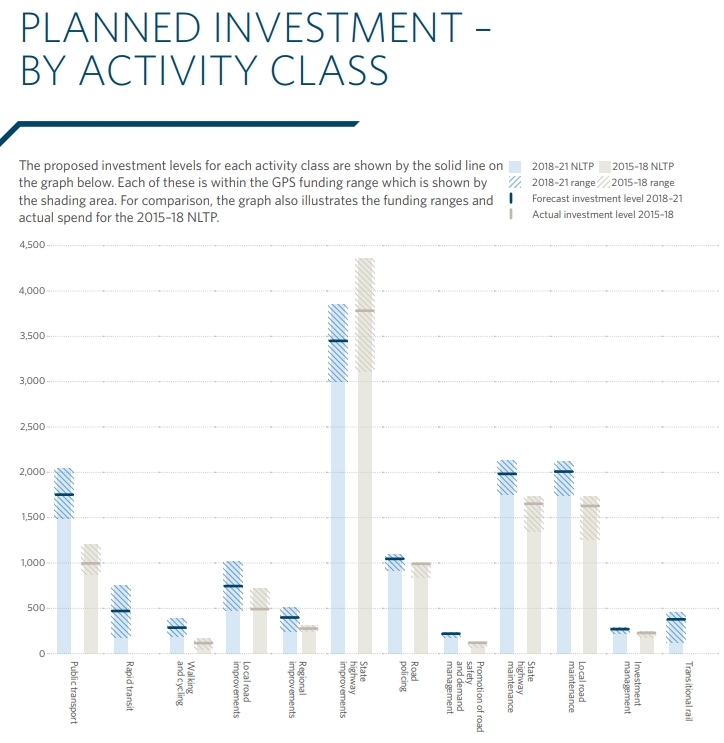 As mentioned above, the NLTP gives effect to the GPS, in which the government outlines the overall transport policy and sets funding ranges for each activity. The NLTP sets where the actual funding levels sit within those ranges. The chart below shows that for the new GPS and for the 2015-18 version. You can see with this NLTP that most activities are about halfway in their funding range. The most notable exceptions are for Road Policing and the new Transitional Rail class. The map below shows where how that $16.9 billion is split up by region. There are similar maps on Safety, Public Transport and Walking & Cycling too. For Auckland, the $5.72 million represents just under 34% of the total spend which means it’s actually less than the region’s population share. You may also recall from ATAP that over 10 years Auckland was expected to get about 38% of spending so it will need to be higher in future versions. Here’s the key projects that will be spent on. And the wordy version to complement it. Access to Auckland Airport and surrounding areas will be improved through the Southwest Gateway programme. 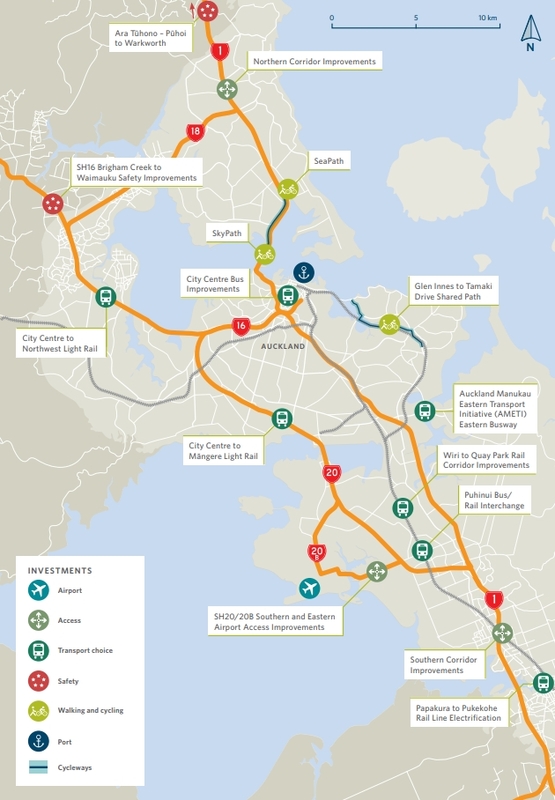 This work includes Puhinui rail station improvements, investigation of rapid transit measures between Auckland Airport and Botany, and identifying improvements along state highways 20, 20A and 20B to improve journey reliability and provide more transport choices. With ATAP and the RLTP this was all expected but it’s good to see the funding is there. Out of $16.9 billion that means at least $3.4 billion. For a country like NZ which has historically ignored these modes, it should be more. This NLTP doesn’t give effect to the GPS. This is business-as-usual. Most of the projects will induce traffic, causing deterioration of the walking and cycling environment, leading to further reduction in active mode share. In partial defense of the government, a lot of roading expenditure was in projects already locked in before they took office. I agree though, the cycling and walking budget is far lower than it needs to be. The claim that 40% is being spent on projects to improve access to opportunities is a joke. To get to that figure, they’ll have included the ‘corridor improvements’ which in fact will induce traffic, reducing bus reliability, reducing active mode share and thus access via those modes, and increasing congestion on local roads. Access will be reduced all around once the induced traffic effects are included. Has the government managed to impose on NZTA that the increase in person-trips due to increased road capacity must be included in modelling? Because until that change has happened, NZTA’s business cases are fanciful and any transport programme is a continuation of the environmental and social disaster we’ve had for the last 60 years. Sadly not much in here that gives a sense that carbon emissions from vehicle use are going to diminish any time soon. I suspect that we have to look the Carbon Zero Bill to require government organisations to set and meet targets. I believe that the Minister still has in mind five yearly targets for different industry sectors. Leaving State Highway 2 between Waihī and Tauranga off the list with no major work scheduled for the next 3 years, especially the section from the Wairoa Bridge through to Katikati, “the most dangerous road in New Zealand”, isn’t a good look when you’ve campaigned on safety. Waihi to Omokoroa safety improvements are on the Bay of Plenty map. I imagine that section of road would be pretty high priority for this. To be spending $3,924m on public transport, but $5,280m road ‘improvements’ is the wrong balance. Matakana link road is one of those they could have dropped. Legacies of this scale of road building include carbon emissions, an inactive population and high DSI. But another important one is the high costs of maintenance we are leaving for our descendants. Twice as much being spent on transport as a decade ago, and the maintenance bill continues to grow: $4 billion in this programme. With the future as insecure as it is, this is highly irresponsible. Under National the SH maintenance budget was cut back to the bone so the money could be funneled into the RONS programme. As a result the SH network is in poor shape and needs more maintenance. So the SH maintenance budget has grown because it was unsustainably low before, not because of a bunch of new roads needing maintenance. Of course you’re right that in the future increased SH maintenance will be required for the proliferation of new roads. The RONS projects are actually very cheaply built and will require significant maintenance (even the public is starting to notice on the Waikato and Kapiti expressways). Has anything changed now? Are the roads budgeted for in this NLTP likely to be built to a higher standard requiring lower maintenance, do you know? No nothing has changed. Although I should clarify that the current approach isn’t necessarily wrong, since it probably results in the lowest total lifetime costs of the asset. We could build roads that’d last a long time without maintenance but the upfront construction costs would be so high that they might exceed what you’d save in maintenance. So either way, roads are expensive and it’d be cheaper to not build them. 1. A lot of the maintenance cost is already embedded. Waterview and similar complex infrastructure add disproportionately, but the impact of new build is largely a simple scaling up on a per lane km basis (i.e. about 1% a year). A few years back the rule of thumb was average annual cost of $16,000 per lane km of local road and $20,000 per lane km of State highway/motorway – remembering that most of that gets spent in one big hit every 15-20 years at renewal time, and most years it’s just negligible inspection costs. 2. Higher-use roads get built to a higher/easier to maintain standard. Auckland arterials are, apparently, built more like State highways since the disruption of closing for maintenance is so great. This is because on average Auckland roads carry double the load of anyone else’s in this country (i.e. 17% of lane km for 34% of population). All the expressway quality roads will be at the higher cost/easier to maintain level. Roads that will get worn out by weathering before traffic ever gets to them, not so much. 3. The Road Efficiency Group/Road Maintenance Taskforce was set up to address questions of maintenance (and construction) costs escalating well ahead of inflation. MOT also did some work on structure of the industry around the time of GPS 2015. One outcome was a decision to sweat and monitor the State highway road assets and see how they actually performed, absent of birthday re-seals etc. I was talking with someone still on the periphery a few weeks back, who indicated that there is some recognition that things may have been left to go too far, but nonetheless it has proven useful to get the chance to really see how various roads actually performed. Unfortunately, there’s no substitute for real-world experience, especially since there isn’t the real-world data to do reliable simulations. 2. Incorrect in the case of RONS, which was the point of my argument. Structural asphalt is the higher cost / easier to maintain standard that you’re thinking of. The RONS motorways and expressways are being built with bound granular pavements instead, which is far cheaper but are being pushed to the limits of what the technology is capable of. This will greatly reduce the renewal intervals, pushing maintenance costs up. Pavement distress is already visible on the slow lanes of the Waikato Expressway North of Hamilton (this probably takes the heaviest traffic loads so it’s no surprise that it’s failing first). 3. That’s a nice summary of the political spin but it’s still nonsense. Sweating assets was a political decision to free up money to spend on new roads. If it was an experiment to see what happened they’d have only done it in a couple of regions to see how they compared, not the entire country. If it wasn’t about spending money on new roads then they’d have spent the money saved on something other than new roads (or reduced petrol excise and RUCs). Re 2, I bow to your greater knowledge. In terms of lifetime cost it must have made some degree of sense, which maybe reflects the low BCRs??? Re 3, I think you are being unfair to the road managers, but I can see how they were in the position of having to make the most of a bad situation/make lemonade from lemons. When I went back through the material from that time there was no basis to push back on a Ministerial view that maintenance could be flat-lined from the preceding actuals. Indeed, when GPS 2015 was being developed, the available evidence pointed towards bloat in that spend; certainly a lack of justification for the wide variations in regional costs. The MOT report on industry structure from about then also continued to reinforce the assumption of some form of padding, and the three or so papers NZTA put put in response added mud rather than light. So ‘the work will get underway’ for LR , does this mean plans, designs, and admin planning only and nothing as positive as concrete and rail in ground or ordering LR rolling stock or construction work in general? If so is this for NZTA to position itself for speedy reversion to proceeding with the already approved EW link and abandoning the LR if National is the next govt? With detailed design and consenting still to happen, I’d be very surprised if there will be any concrete or rail in ground by 2021. It is certainly possible that the EW link could reappear in 2020 if National came back to power. I think that is unlikely though, all polls point towards National being in opposition again and NZ doesn’t have much history of throwing out a government after one term. Also National don’t have a lot of history of making big changes when they come into power, it’s much easier to bark at cars in opposition. They have already suggested they might keep Kiwibuild. I see that $2.9m has been allocated “for the Hamilton to Auckland passenger rail start-up service”. Does anyone what this money will actually be used for? That will just be enough for a couple or three talk fests for various councils’ consultants, AT/KR managers and probably NZTA reps, maybe a university expert or two as well. No doubt including their various expenses etc..
Basically nothing will be done apart from a report stating further investigation and funding for investigation is needed. It’s for the chap with the funny uniform who turns the hand-crank on the front of the locomotive. I’m disappointed, they seem just as committed to heavy 50 ton vehicles as the last government I thought they were more committed to rail, 1000 to 2000 tons on a safe alternative is to me the only way forward not following the same failed system of the last 60 years. 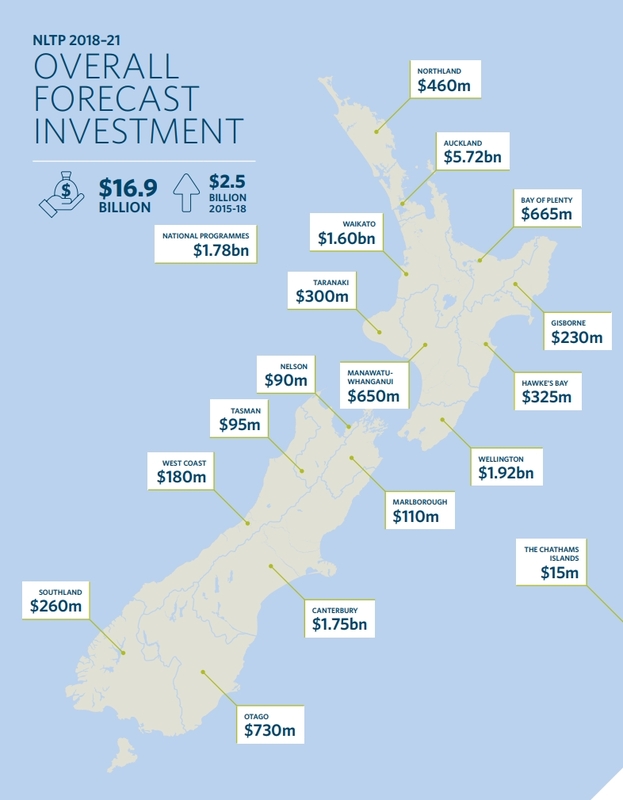 I guess the NLTP doesn’t include freight rail – and we have to look at Kiwirail’s funding alongside this NLTP? The things to watch for will be: third and fourth main in Auckland, Wiri to Port; Wiri to Tauranga; and Wairarapa to Wellington, perhaps with a ban on logging trucks over the Rimutakas. Those are meaningful rail projects. Getting the freight onto rail in those corridors could work well for all concerned. The phase 2 GPS will, hopefully, expand on the rail freight plans. The existing subsidies outside the NLTF/NLTP are interesting enough, but they are coping levels of spend for the most part. What is missing is a clear role statement for rail and matching investment strategy. Most of the last 60 years was protected rail, or laissez-faire management, both of which I agree were gross disappointments. The last 7 years, of allowing 50-tonne trucks, combined with RUC reform, has seen a meaningful crimp in heavy truck trip growth, with the extra weight allowing bigger loads, and the better pricing through RUC encouraging back-loading. The road footprint is better too, both from a wear-and-tear perspective and a fit-to-lane. That doesn’t excuse poor planning, of course; a 50-Max is not meant for suburban streets! But a lot of freight moves where rail just doesn’t go or can’t afford to. Whatever the plans, the government needs to encourage integration of road and rail freight in ways that exploit their respective advantages. Integration of road and rail freight in ways that exploit their respective advantages will certainly see the removal of 50 tonne trucks from any location where there are vulnerable road users. If they’re going to build LR to Mangere and they’re going to replace the old Mangere bridge for pedestrians and cyclists then the logical choice would be to build a bridge that can take both rail and pedestrians/cyclists rather than having to build 2x bridges for them both. “Investment will be allocated to the electrification of the rail line from Papakura to Pukekohe”. Very good, but no mention of any funding to refurbish (i.e. rescue) the NIMT Class 30 electrics for another 30 years of useful, non-polluting life. This would cost peanuts in the scheme of things. Is Phil Twyford about to renege on his promise when in opposition, not to let the NIMT electrified operation cease? I thought Kiwi Rail funding for freight was separate. Projects mentioned here are about improving rail public transport, with freight a secondary beneficiary. NIMT electrics are about freight, not public passenger transport. But this article is entitled “2018-21 National Land Transport Programme released”. Doesn’t this include freight? I was thinking the same. What a PR disaster for this coalition if the nimt electric ceases and the EF locos get scrapped or left in some siding to fall apart. But I’m optimistic that won’t happen and it will be Phil to the EF rescue. LR to Mangere,,,,, What happened to the Airport as the destination? SW LR is mostly not about the airport. Referring to it as the Airport Line tends to bring out those who fixate on the airport to the exclusion of most places along the way, and then go on about wanting an express, HR, etc, etc. AT & NZTA seem to have realised this hence the change to Mangere.